I didn't buy it but I did listen to it at a friend's. I am approaching this as openminded as I can. 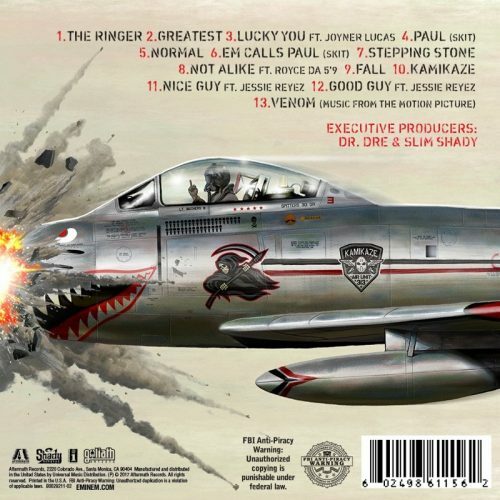 I will start by saying the Eminem Show is on my top 10 list for greatest rap albums ever. Still know every song like the back of my hand. While this album reminded me of that album, it was not the same. He is 45 now and yeah, he still has skill but the actual lyrics in some of these songs is just stupid. Maybe I just outgrew his childish humor or I just don't understand what this is, but this doesn't make any sense to me. That is just one example. That is on the track "The Ringer". On a 1 to 10, I won't give it a 1 but I am not giving it a 10 either. I rate it a 6. Maybe I am being too harsh but I wasn't feeling it enough to want to buy the album myself. I'm just not as fond of modern Eminem as I was of his older works. I don't know if that is because my life has changed or if its just a case of his change in style. I listened to the album last night and really didn't feel it. Wasn't awful, but not great either. I would agree with the 6 rating you have given. It certainly isn't the same as it used to be. Like his music, I guess you kind of expect him to go off on his tracks. I rate albums on a 5-star system and I give this one a 3.5 which I guess would be like a 7/10. I think it is worth buying but it isn't one I will remember 10 years down the road. Not like his first few albums. It was solid for his own name's sake but I am just not a fan of his anymore. Not like I once was. I can't give a fair grade to the album in that I haven't listened to him in a long time. I have heard some tracks here and there but my taste in music has changed. It is impressive he still sounds the same though after all these years. Finally listened to the album in full and I must admit, it was better than I thought it was going to be. With that being said though, I do find it highly overrated by people who just get nostalgia vibes from it. Yes, it sounds like Slim, but it isn't. He is a 40 something year old sober man. It's all been said above me already. It ain't a terrible album but it's nowhere near as good as his old albums. That Shady is long gone, he should have retired years ago. I thought "When I'm Gone" was a retirement track when I was a kid haha.